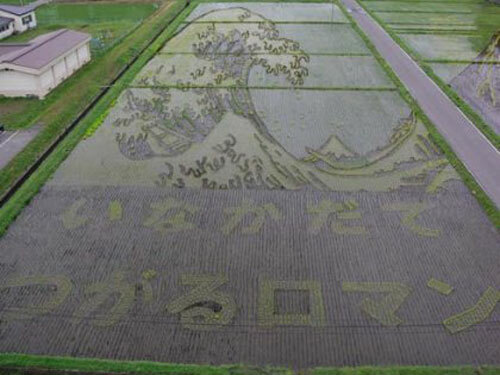 Inakadate Village, Aomori Prefecture, about 600 kilometres North of Tokyo is famous for one of the finest and amazing crop art works created annually by planting four varieties of rice with differently coloured leaves in the paddy fields covering an area of 15,000 sq. meter. To a beholder the final product is spectacular not only due to the huge scale but also due the finer details of the art work and colour combination. 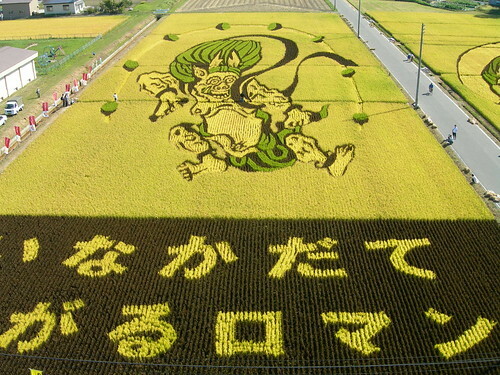 Rice-paddy art was started in the village in 1993 out of an idea that grew out of meetings of the local village committee. 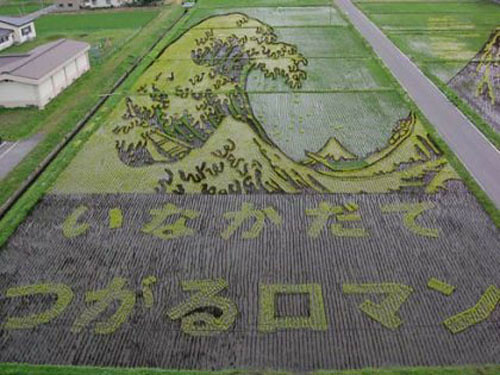 In the first nine years, local farmers and other local residents grew a simple design of Mount Iwaki every year. Within a decade their ideas grew more complicated and attracted more attention. 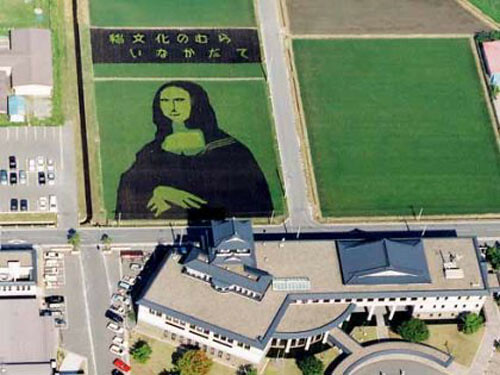 From 2003 they started planning well before the time of actual planting and made a grid map on a large drawing board to achieve masterly results. From 2006 computers were used to precisely decide which variety of seedling should be planted where. The plantings are carried out in May-June and as summer progresses, the plants grow and the detailed artwork begins to emerge. The art work is so huge that from the ground level it is not possible to properly discern the shape. A mock castle tower was therefore built on the village office to see the beautiful art work. 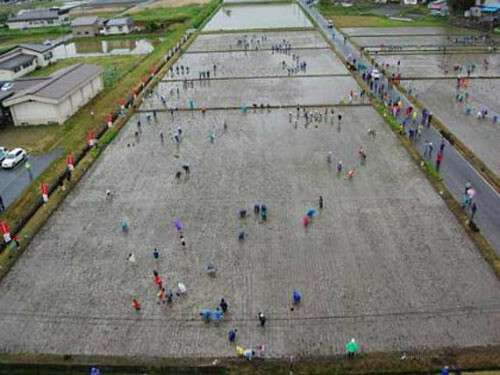 The village has earned a name for itself for its agricultural creativity and several thousand visitors visit Inakadate in September every year, when the crop has fully ripened and is ready for harvesting. Some come as tourist to view the beautiful artwork and some volunteer to help in the harvesting. After the harvesting the grand design vanishes and fields are ready for next years design. 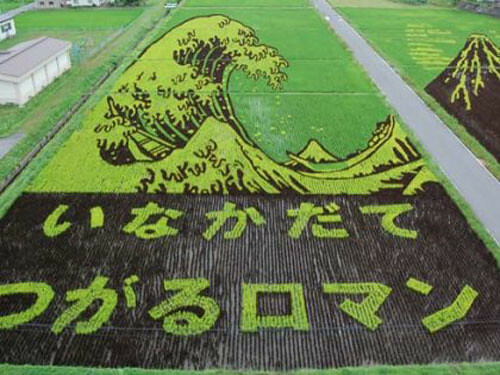 Over the past few years, other villages have also started such artwork in other rice-farming areas of Japan. Here are few images from 2007 which show the progression. View location in Google Earth Google Maps. A fine post by Washi, Senior Member of Google Earth Community Forums.